Support and resources for learning and teaching, the delivery of Curriculum for Excellence, education quality, standards and improvement, learner assessment, community and lifelong learning, Gaelic education and the innovative use of learning technologies like Glow. Education Scotland is the national body in Scotland responsible for supporting quality and improvement in learning and teaching from early years to adult and community learning, producing support, resources, case studies, information and and ad ..
3. Early lear­ning and childca­re /lear­nin­gandtea­ching/earlylear­nin­gandchildca­re/ind..
6. About Early Years /lear­nin­gandtea­ching/earlylear­nin­gandchildca­re/abo..
7. Regula­tion and inspection /lear­nin­gandtea­ching/earlylear­nin­gandchildca­re/abo..
8. The Child at the Centre /lear­nin­gandtea­ching/earlylear­nin­gandchildca­re/abo..
10. Natio­nal Care Stan­dards /lear­nin­gandtea­ching/earlylear­nin­gandchildca­re/abo.. In total 0 links were found which refer to Educationscotland.gov.uk. The most used keywords in text links are Learning and Teaching, Education Scotland and Education. Individual words like Scotland, Learning, Teaching and Festival are frequently used in text links from other websites. The most important link sources for this website are Callscotland.org.uk and Newtreedesign.co.uk. 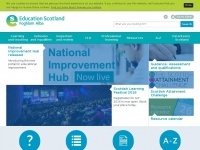 The homepage of Educationscotland.gov.uk and the subsite /slf/index.asp are most referenced by other websites. The table shows the most important links to Educationscotland.gov.uk. The table is sorted in descending order by importance. 8. www.journeytoexcellence.org.uk What is RSS? The table shows websites of Educationscotland.gov.uk, which are often linked by other websites and therefore they are classified as important content.